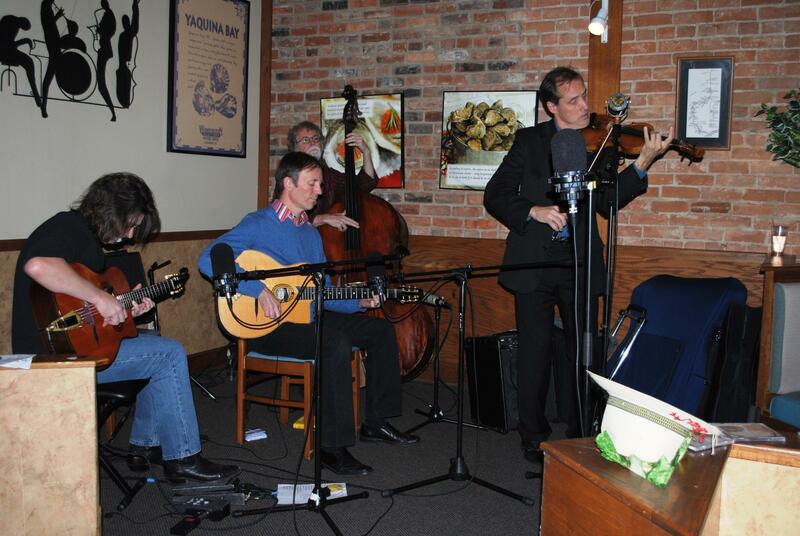 An Evening with Faux Frenchmen - Recorded Live Just For WVXU/WMUB Listeners! 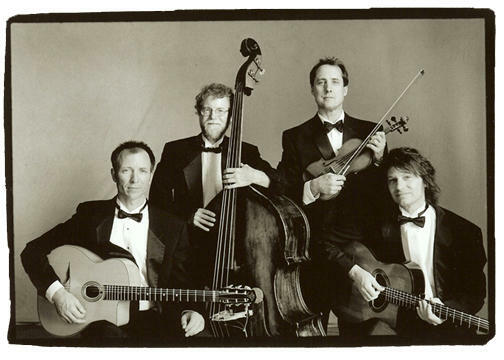 The Faux Frenchmen are acoustic guitarists Brian Lovely and George Cunningham, acoustic bassist Don Aren, and violinist Paul Patterson. Faux Frenchmen, onstage at Washington Platform and Saloon, recording this special birthday concert. Cincinnati is home to an exceptional quartet of musicians who joyously keep alive the Gypsy Jazz music made famous by legends Django Reinhardt and Stéphane Grappelli. They call themselves Faux Frenchmen, and on Monday, November 9, 2015 they brought their unique musicianship and unbridled love for this music to the stage of downtown’s Washington Platform and Saloon. The audience was made up of Cincinnati Public Radio donors, and the concert was recorded and will be broadcast on Saturday, January 23 from 8:00 to 10:00 pm on 91.7 WVXU, 88.5 WMUB and online at wvxu.org. Brian O’Donnell hosts. This broadcast date was chosen to celebrate the birthdays of both Reinhardt (January 23, 1910) and Grappelli (January 26, 1908), contemporaries who founded the Quintette du Hot Club de France, the first all-string band, in 1934. The date also falls in the middle of WVXU and WMUB’s critical Winter Fund Drive, which generates income necessary to keep both stations operational, providing local, national and international news plus some of the best-loved public radio programs like Wait Wait Don’t Tell Me, This American Life and A Prairie Home Companion.